Replace or upgrade a Socket 7 or 370 CPU heatsink fan assembly. 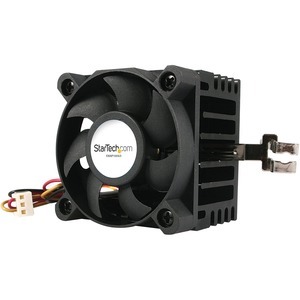 StarTech.com's Socket 7/Socket 730 CPU cooler fan optimizes heat dissipation and removal by combining a large aluminum heatsink and 5cm brushless ball-bearing fan, helping to ensure ideal operating conditions for your hard working CPU. A broadly compatible CPU cooling solution, the Socket 7/Socket 730 CPU cooler fan provides quiet cooling for Socket 370(PPGA) Celerons, Socket 7 Pentiums, AMD K6, K6-2 and Cyrix chips and is powered using a TX3 (3-lead) connection to either the computer power supply or the motherboard (direct). When powered directly from the motherboard, the fan speed and operating status can be monitored for ideal performance. Capable of moving up to 8.84 CFM of air away from the CPU, the Socket 7/Socket 730 CPU cooler fan features a high-efficiency fan blade design and is backed by StarTech.com's 2-year warranty and free lifetime technical support.